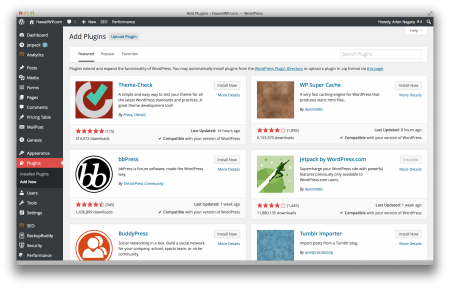 Yes, it seems like there’s a new version of WordPress software every few months. That’s because there is. WordPress now runs more than 20% of all websites on the internet! That’s an amazing number of websites. And because WordPress is so popular, they want to keep innovating and improving. Now that you can have a live preview of videos, images, and other media that you add to your posts, add some multimedia pizzaz with your posts. Is it compatible with my version of WordPress? When was the plugin last updated? A recent updates means bug fixes, and a solid plugin. How popular is it? Are there more than 10,000 people using it? How do the users rate the plugin? 4+ stars usually means you have a pretty good plugin. Who made the plugin? The author is the final piece I look at. This might not mean much to a normal person, but there are several excellent developers that make exceptional plugins and when I see their name, I always choose their plugins above other highly rated plugins because of who they are. 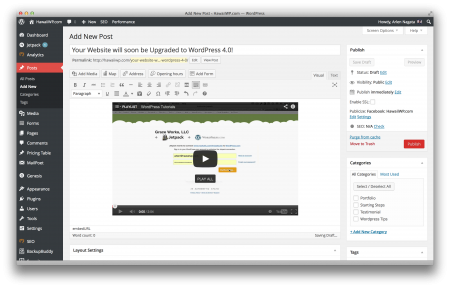 WordPress and therefore your website keeps getting better and better. Take a moment to login to your website and browse the new features. You’ll probably like what you see so much that you’ll just want to publish an article or two.